I have to qualify this review as more of a first look as I only had the jacket for a couple of days as part of a recent meet Petesy organised. These are my initial views and thoughts. Remember what works for me and what I like might not work for you or be to your liking. The jacket was a very bright green, not sure if it's an attractive colour but it would certainly get you noticed. 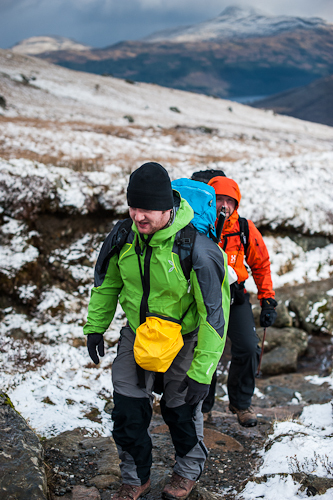 For those of you who don't know Active shell is a new fabric from GORE-TEX® and it's a bit of an enigma, some people love it and others hate it. According to the official bumph from GORE-TEX® the jackets engineered from the fabric are built to provide durable water and wind protection as well as extreme breath-ability. The Ret value for the material is less than 3. The fabric is a 3 layer construction and lighter in weight to deliver excellent comfort when being worn next to the skin. The garments are ideal for highly aerobic activities like mountain biking, fast alpine ascents and trail running. They also claim that garments made with Active Shell will have a maximum weight of 400 grams. The test jacket weighs in at 307g according to Montura. I'm not sure if that was for the size medium that I had or for the largest jacket they sell. My first impressions were very good on having just been handed the jacket straight out the boot a car. I was very impressed with the quality. It did also feel very light in my hand and the fabric was very soft and subtle to the touch. With a more robust feeling version of Active Shell on the top of the arms and shoulders. The classic rub points. It was a well put together jacket. The quality was very evident, no loose threads or badly taped seams that I could see. Nothing extravagant, just a couple of hand pockets and a hood, no toggle adjustments. The cuffs, hood and hem were elasticated. The hood had a Velcro volume adjustment at the back. There are reflective strips on the hem and around the jacket and the logo. On the cuffs it had a couple of elasticated thumb loops which I thought was interesting, I do like thumb loops on tops. It also had robust waterproof zip with a really big storm flap behind it. The expected retail price in the UK is £185. The fit of the jacket was quite accommodating for a medium including my beer belly which is fine in my opinion as it means you can get a layer, or 2 at push below the waterproof shell, like an insulating jacket or fleece. Maybe that's what they call an active fit. I was very nice on, it felt as light as they claim and my initial hand hefting. There was good movement in the arms and torso.It was one of those days and the jacket got all sorts of weather thrown at it; snow, rain, sleet and wind, a really strong driving wind. A typical west of Scotland day. I'm not sure how it would cope in extended periods of rain over a few days. However I was fine in the jacket and felt that the fabric was breathing well as I wasn't wet or damp even with all the exertions my unfit body was going through pulling up the track to the Cobbler and it was coping really well in the wind as well. The only thing that I could pick fault with and fault is not the right word. It was more of an annoyance I found that because the hem of the jacket was elasticated it would and could ride up. The thumb loops worked well, keeping the sleeves down over the cuff of my gloves and therefore sealing out the drafts. The hood was good, not sure how it would deal with a helmet but was fine over my watch cap and I had no issues with the fabric. All in all I had a great time in and found nothing wrong with a very well made jacket from a brand I hadn't heard of before. Very impressed indeed.